What happens when a superhero is forced to retire? What happens when secrets from the old days threaten those they love? 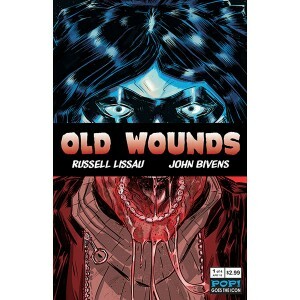 That’s the premise behind Old Wounds from Russel Lissau and John Bivens which follows retired vigilante Michael Lane. The series promises both a crime drama and action thriller; based on the first issue they definitely hit the target with a great premise full of promise. Two detectives show up at Michael Lane’s house and inform him that his ex-wife was killed in a home explosion. Taken back by the news, he asks the detectives to leave so he can process the information. They do as he requests and he enters a hidden room to reveal past clippings of his time as a superhero with his ex-wife. He knows secrets from his past have come back to haunt him and those he fought crime with, especially when another explosion occurs. At 24 pages the opening does feel a little light, but Lissau does pack in plenty of suspense. We still know very little about Lane’s background, but we are given plenty of panels that slowly fill us in as the story progresses. There are small details such as the hints of injury that caused him to retire that are subtle but tell us much in a limited page count. It’s an odd mix to balance of fitting in enough to details to keep us hooked while leaving much unsaid, but it’s pulled off well. The plot has a real noir feel to it and the choice of going full black and white fits the story perfectly. With little dialogue on several pages, John Bivens’ art is left to inform us of Lane’s history. It is more than up to the task. He packs in plenty of detail into Lane’s haggard face and run-down demeanor. The lack of color really lets his pencils shine in progressing the narrative. For an opening issue, it did just what it should which is have us engrossed enough to want more. Right now we really want more. Lane is very much an enigma still and we’re excited to learn more about his past as things unfold around him. Old Wounds is off to a great start and a perfect pair for those who like a little mystery in their superhero tales. Thanks for the incredibly kind words!!!!!! It was a great first issue, we’re looking forward to seeing the rest of the story unfold! I just realized, tho: it’s Russell and John. You got a couple typos there.